We had a fantastic first two days of school at LMS. Our team was pumped and eager to welcome the students and the students appeared just as excited as we were to start a new school year. I shared a few pictures on Thursday that highlight how we kicked off the day. I will share a few more through Parent Link. I would be remiss if I didn't take a moment to personally thank the LMSPA for their generosity. If you had a chance to look at the pictures from the first day, you may have noticed that everyone is wearing a blue shirt that says "Team LMS." This year, we are focusing on enhancing our school culture and climate, working as a team, and building leadership capacity in our school. We spent a great deal of time in our Back to School Opening Meeting learning and discussing things that we can do as a staff to grow in these areas. The theme for the meeting was,"TEAM LMS: Building a Culture of Learning, Leading, Caring and Success!" As you can see, the shirts tie in very nicely with the theme and were a great way to symbolize to our students and parents that we are all collectively on the same page. The shirts also generated "spirit" for the first day. Thanks so much LMSPA for helping us fund the shirts by splitting the cost. Speaking of teamwork, I want to thank all of the parents that discussed and reinforced the school expectations that were shared in the last update at home with your student. Secondly, I want to express TREMENDOUS gratitude to those that are adhering to the morning/afternoon traffic and drop off/pick up procedures that have been communicated. I know it can be frustrating and sometimes challenging, but in the end, what you are doing is putting the safety of our students first. WE APPRECIATE YOU! The first few days are bound to have a few kinks. We are working through them and trying to get it all flowing smoothly out there, so please bear with us. May I also ask that you please refrain from telling your student to do anything other than what's been communicated. 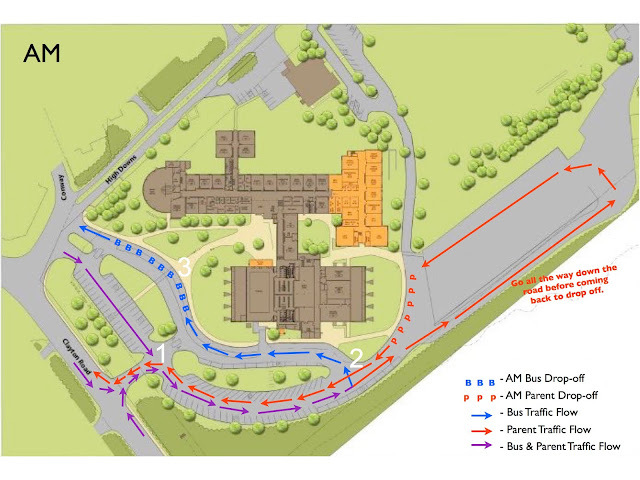 Asking students to meet you in the parking lot or in the back or side of the building is asking them to not follow what's been communicated as a building expectation. It's puts them in jeopardy of getting into trouble if observed not following procedures. PLEASE if you have an extenuating circumstance, let us know and we will try to accommodate you. PLEASE also be kind to the staff outside (in the heat) doing their very best to move traffic along and get everyone in and out as best as possible. It can be quite upsetting to have someone snap at you or make hurtful remark. TEAM WORK makes the dream work! Please feel free to share any concerns or ideas that you have. A few parents shared feedback with us last week and we made adjustments. To help kick off the year and support our dedication to the importance of consistency, and to familiarize the students with all of the principals, we made a video that was shown to all of our LMS students on the first day of school. Take a moment and check out the LMS Administrative Team and some of the expectations we want all our students to be familiar with as we move into this new year. Thank your for your support as we work to maintain and cultivate an environment where students are considerate of each other and make school a safe and friendly place to learn. A flyer about the district’s general plans for the Total Solar Eclipse was sent home in the district Back-to-School packets, and is also attached here. The following points address the questions we are hearing most often from parents. Early childhood students will not be participating in outdoor activities. Teachers and administrators at every level will have been trained on safe viewing and supervision of the event. If you prefer that your child not participate in outdoor Solar Eclipse viewing activities, please complete the opt-out form linked to the article on the homepage of the district website entitled Solar Eclipse Information no later than Thursday, Aug. 17. Your child may be given the opportunity to view the eclipse on television. While we believe the Solar Eclipse provides an outstanding educational opportunity for students which can be safely enjoyed and supervised, your child is not required to participate in the related activities. Please also remember that the decision of whether or not to send your child to school on any given day is yours. Finally, traffic in the area on Monday afternoon could be heavy. We will do our best to alert parents of any delays in bus transportation. However, please consider the possibility of delays when making plans for your child’s arrival at home. This is truly a once in a lifetime opportunity to view a Total Solar Eclipse in St. Louis. Thank you for your support in making this a safe and memorable day for your child. Due to space and parking limitations, we are asking parents not to come to LMS to view the eclipse. The fact that it will be dark during the eclipse makes it vital that we reduce the number of people and chaos on campus. If you need to check your child out that day, please call the main office first thing in the morning and let us know so that we can have an early dismissal slip ready to issue the student. We ask that all students be checked out no later than 12:45 if at all possible. PLEASE NOTE: In an effort to allow all our staff to view the eclipse, we will be closing our office for approximately 30 minutes (1:00-1:30). As stated in the district letter, your child should bring a towel to sit on and may wear a hat that day. Students will take the Scholastic Reading Inventory (SRI) on Tuesday, August 22 in their social studies class. The SRI is a reading assessment that helps us make informed decisions about students and their growth, it helps us goal set, and most importantly, it ensures that we get the right book in the right hands. We will encourage students to do their best so we have accurate and reliable data to help us work with students to build an appropriate literacy rich learning environment. Girls in the know is coming soon to Ladue Middle School on Mondays, October 2 - 30 (skipping the 23rd), from 6:30 -7:30 pm in the LMS Library. Girls in the Know is a non-profit working to educate and inspire young women. Girls in the Know connects leading female experts with pre-teen girls, and their trusted adult who also attends, together, so both parties know the vital information necessary for a healthy life. Doctors, police officers, dietitians and counselors present four different workshops to empower young girls. GITK is a catalyst for meaningful conversation, community, and thriving relationships through the teen years. Space is limited to 20 pairs. Register today at https://girlsintheknow.opendonorcrm.com/st-louis-registration-form . Should you have questions please call (314)-277-5312. Something new that families will notice on student schedules this year is a period designated as a "class meeting." Class meetings are small, multiage classes that meet approximately once every two weeks throughout the school year for 38 minutes on Wednesdays. The first class meeting was held on Friday, August 18. Feedback from students and teachers has been positive. The district has adopted the Olweus bullying-prevention program this year, and class meetings will be the forum for lessons specifically designed to make LMS a safe and bully-free community. The dates for the Memphis trip are March 8-9 and the cost per family is $200.00. More information will be shared later. If you are interested in serving as a chaperone, please contact Mr. Brian Beracha at bberacha@ladueschools.net. PLEASE NOTE: Parents who chaperone will have to pay the fees to attend the trip. Parents may also have to get a background check per district guidelines.